Visit www.wiley.com/go/dillon for additional student and instructor resources. Michele Dillon is professor of sociology at the University of New Hampshire and has many years of experience teaching sociological theory to undergraduate and graduate students. Her previous publications include Catholic Identity: Balancing Reason, Faith, and Power (1999), Debating Divorce: Moral Conflict in Ireland (1993), Handbook of the Sociology of Religion (ed.) (2003), and In the Course of a Lifetime: Tracing Religious Belief, Practice, and Change (with Paul Wink)( 2007). List of Timelines, Boxes, and Topics. 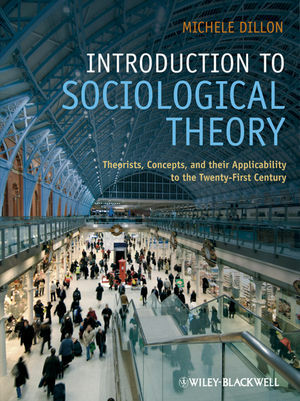 Introduction: Welcome to Sociological Theory. Societal Transformation and the Origins of Sociology. The Sociological Craft in the Nineteenth Century. Capitalism as a Distinctive Social Form. The Division of Labor and Alienation. Societal Transformation and Social Cohesion. 4. Structural-Functionalism: Talcott Parsons and Robert Merton. Social Differentiation, Culture, and the Secularization of Protestantism. 5. The Frankfurt School: Technology, Culture, and Politics. Jurgen Habermas: The State and Society. 6. Conflict, Power, and Dependency in Macro-Societal Processes. Ralf Dahrendorf’s Theory of Group Conflict. Dependency Theory: Neo-Marxist Critiques of Economic Development. 7. Exchange, Exchange Network, and Rational Choice Theories. Development of the Self through Social Interaction. The Premises of Symbolic Interactionism. Erving Goffman: Social Exchange as Ritualized Social Interaction. Symbolic Interactionism and Ethnographic Research. Standpoint Theories1: Dorothy Smith and the Relations of Ruling. Standpoint Theories 2: Patricia Hill Collins – Black Women’s Standpoint. 11. Theorizing Sexuality and the Body. 12. Sociological Theories of Race and Racism. Social Change, Race, and Racism. Slavery, Colonialism, and Racial Formation. William Du Bois: Slavery and Racial Inequality in the US. Culture and the New Racism. 13. The Social Reproduction of Inequality: Pierre Bourdieu’s Theory of Class and Culture. Family and School in the Production of Cultural Capital. Immanuel Wallerstein: The Modern World-System. From World-Economic to Global Inequality. Political Globalization: The Nation-State in the New Order. Cities and Migration in a Globalizing Society. Political Mobilization in the Globalizing Society.